Berchtesgaden, at the border to Austria: while the 911 still has to wind its way up towards the summit, its roar has long since arrived at the upper plateau of the Roßfeld panoramic road. The bare interior and the roll-over cage mean that the metallic howling of the boxer engine is transmitted into the cabin relatively unfiltered. 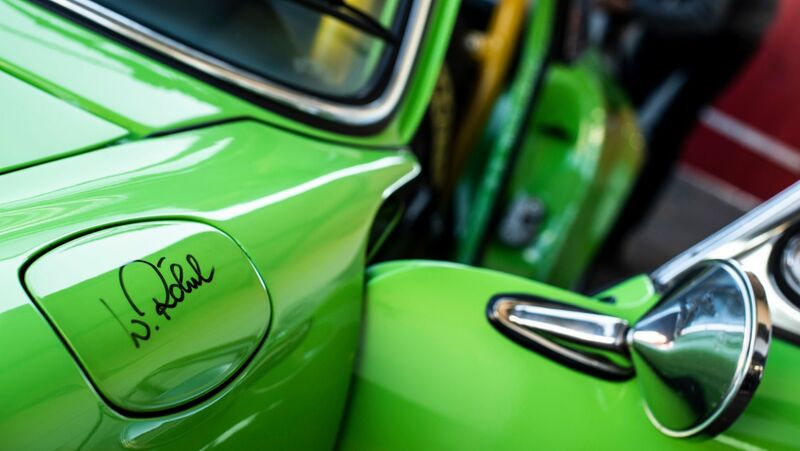 For some people in the area, this dazzling green sports car with a weight of just 900 kilograms simply produces a racket – but for its owner, Manfred Huber, it plays the most beautiful six-cylinder overture. “I recommend earplugs on longer journeys,” shouts the 52-year old driver towards the passenger seat, with a grin on his face. 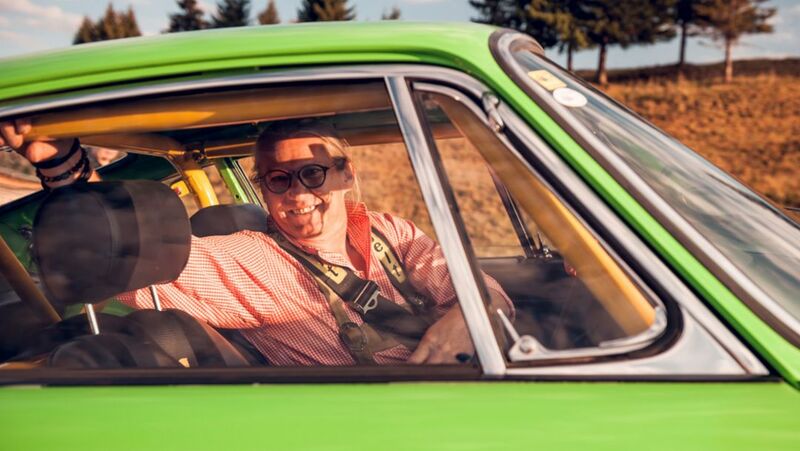 Although Huber’s arms work tirelessly, rapidly moving between the steering wheel, gear lever and another lever mounted next to it, he seems to enjoy every single mile. There is no sign of exertion. He winds down the window, takes in a deep breath of Bavarian mountain air and opens the throttle lever a little further. Huber controls the sports car exactly as he wants. Without assistance. Without automatic transmission. A look down next to him, and the unusual lever construction directly beside the conventional gear lever explains itself. It is Huber’s direct link to the pedals of the Porsche – because there is a gap between him and the vehicle floor. Manfred Huber was born without legs. But for the native Bavarian, missing out on the pleasure of driving a Porsche was simply not an option. At the first sharp-right hairpin bend of the Roßfeld panoramic road, the Reger Turn named after a German rally driver, Huber performs a remarkable feat: he simultaneously operates the brake and accelerator pedals with the levers and drifts through the sharp corner. Just like in a training demonstration. While his left arm turns the steering wheel sharply, his right arm concentrates only on the two levers. Huber skilfully negotiates a few more bends like this on the way to the summit before he finally stops the Porsche at the top. In the car park, he opens the door, swings himself out of his 911 and walks on his hands over the cobblestones to the nearest bench. Swinging himself onto the bench, he looks across the breathtaking mountain scenery of the Berchtesgaden Alps, his home, and takes a moment to reminisce: “The thing with Porsche and me started early on. As a teenager, I was playing with a few friends down in the village and suddenly heard this chainsaw-like screeching noise. I had never heard anything like it before. A short time afterwards, I caught sight of the Porsche. And I have been hooked ever since,” says Huber with shining eyes. 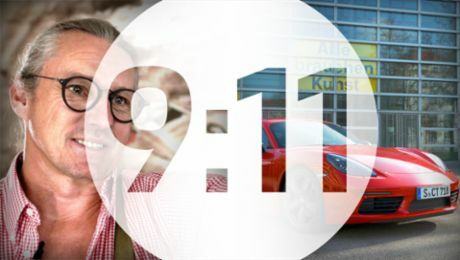 From this moment on, three digits were indelibly etched in the mind of the Bavarian: 911. From here on, everything went very quickly. At some point, a disillusioned Huber gave up a supposed career at a bank and opened his own workshop in order to finally move a little closer towards his dream. In his parents’ cowshed, and without any heating, he worked on creating his version of a restoration workshop, which would later bear the name “Oldiegarage”. At the same time, he completed his training to qualify as a vehicle mechanic. Many don’t want to take him seriously, the man without legs. Some want to help him, while others even place obstacles in his way. But Huber has his goal firmly in his sights, and he wants to achieve it on his own, if possible. On his hands if necessary. He even built his house himself at some point. 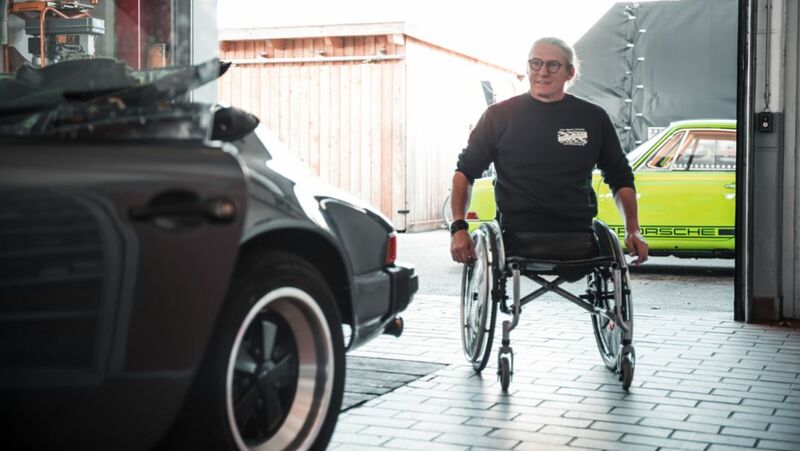 Huber made a few enhancements in the Porsche until it met his requirements to also take part in a rally or mountain race. He removed unnecessary ballast from the 911 and increased the displacement so that the engine produced 200 PS. He then learned how to drift with the help of Walter Röhrl. There is a silent greeting from the world rally champion on the fuel cap. After all the hardships in his life, Manfred Huber would have enough reasons to just think of himself. But here too, the native Bavarian does not take the easy route. On the closed-off airfield in Zell am See, Austria, he organised an outing for 11 people with severe physical and mental disabilities. Together with the former German international footballer Paul Breitner, Huber also supported a hospice for children with cancer at the Chiemsee lake in Bavaria. He has not yet had enough by any means. And, he says, there is no reason for him to look back at what he has achieved with a feeling of pride. “I wouldn’t have done it any differently with legs,” states Huber, as he swings himself into the 911 against the mountain backdrop of his home, and disappears down towards the valley with a distinctive roar. Porsche publishes a wealth of entertaining and informative contributions from the world of Porsche at its website, 911-magazin.porsche.de. Whether it's presenting new models or highlighting milestones in the company's history, the online TV series complements the Porsche customer magazine “Christophorus”. The Rennsport Reunion and other highlights in the latest episode from the 9:11 Magazine online TV series.